Despite Russian denials of their direct involvement into the secessionist “Donetsk People’s Republic” (“DNR”) and “Luhansk People’s Republic” (“LNR”), there is an increasing volume of evidence available that shows these denials to be simply false. 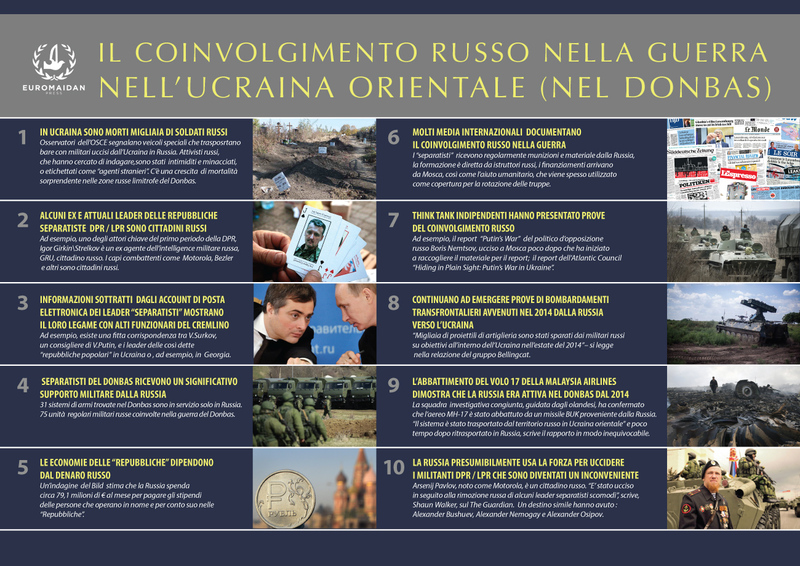 Here are ten key things to know about Russian involvement in Ukraine’s eastern territories (graphic also available in Italian). 1. Thousands of Russian soldiers have died in Ukraine. Despite stipulations in the Minsk Agreements, Russia permits the OSCE’s Special Monitoring Mission in Ukraine to monitor only two small spots on the internationally recognized border between Ukraine and Russia. Despite this limitation, they are still able to report on vehicle activity at the border checkpoints and it is a regular side note that there is a regular flow of vehicles from Ukraine into Russia carrying the words “Cargo 200” which is a Russian military code indicating that the vehicle carries dead bodies. Almost every weekly update from the OSCE mentions this observation. In one recent article by a well known Russian expert Paul Goble draws attention to a statistical anomaly in three Russian regions, specifically Nizhny Novgorad, Voronezh and Krasnoyarsk. Goble points out that in just these three regions the number of recorded deaths in 2014 and 2015 compared to previous years suggests as many as 6,312 “excess” deaths have occurred. 2. Many former / current leaders of “DNR”/”LNR” are Russian citizens. Some of the warlords of the so-called “Donetsk People’s Republic” (DNR) and “Luhansk People’s Republic” (LNR) come from Russia and had absolutely no ties to the Donbas region prior to the start of the conflict there. For example, one of the key actors of the early periods of “Donetsk People’s Republic” Igor Girkin (also known as Strelkov,) is actually a former FSB military intelligence agent from Moscow and a Russian citizen. Militant leaders with the nicknames Motorola, Bezler, Babai are among a large number of individuals who are or have been associated with the “DNR”/”LNR” and are also Russian citizens. Another Russian connection is Alexander Kazakov, who is an image and PR consultant to the “DNR” and the previously unknown “leader” of that unrecognized entity, Alexander Zakharchenko. Even though there are locals in the armies and institutions of the so-called “republics,” few of them have leadership roles or any decision-making capacity. On 25 October 2016, the Atlantic Council’s Digital Forensic Research Lab shared a comprehensive analysis of a wealth of hacked Email communication that was dubbed the #SurkovLeaks. Vladislav Surkov is undoubtedly one of the most influential individuals in Putin’s inner circle, and the leaked communication demonstrate that he is the Kremlin point-man for Russia’s management not only for “DNR”/”LNR,” but also is involved in the management of the self-proclaimed break away/frozen conflict Georgian regions of South Ossetia and Abkhazia. The Email accounts of Surkov’s two assistants were hacked by a Ukrainian hacker group called “Cyber Junta,” and the resulting picture of his involvement in the Donbas war is quite conclusive. According to other media reports based on the #SurkovLeaks Denis Pushilin, one of the “DNR” leaders, is completely dependent on and subordinate to Surkov. 4. Donbas separatists receive significant military support from Russia. A study by the international volunteer community InformNapalm from 17 September 2016 shows that 31 weapons systems identified in Donbas entered service with the Russian military between 2004 and 2015 and have never been produced in or sold to Ukraine — this study was presented at meeting of the Parliamentary Assembly of the Council of Europe. Another report by InformNapalm focused on Russian troops in Eastern Ukraine and it identifies 75 regular Russian military units involved in the war in Donbas. This report was presented at the NATO Parliamentary Assembly in Istanbul on 19 November 2016. 5. The economies of the “republics” depend heavily on Russian money. Bild journalist Julian Röpcke from Germany produced another piece of comprehensive research. By analyzing the economics of Donbas secessionist “republics” he showed the extent to which Russia finances the “DNR”/”LNR”, because they simply cannot survive without external financing. Röpcke has also traced how Russia channeled money to the “republics” primarily through banks in the Georgian region of Abkhazia, another self-declared “secessionist” territory which has been under Russian de facto control since the early 1990s, which was formally recognized by Russia as a state after the Russo-Georgian war of 2008. The Bild report estimated that Russia spends €79.1 millon per month to pay salaries in the republics. 6. International media produced numerous reports about Russia’s involvement in the war. One of the most recent reports from the self-declared “Republics” in eastern Ukraine was produced by France 24. French journalists reported that the militants receive ammunition and equipment from Russia; they are being trained by Russian instructors; receive necessary funding from Russia, as well as humanitarian help (something which is often used as a cover for the rotation of troops). 7. Independent think tanks have also presented proof of Russia’s involvement. The Atlantic Council, a well-known American think-tank published a study on Russian role in the life of Donbas “republics.” The presentation of this study begins: “Russia is at war with Ukraine. Russian citizens and soldiers are fighting and dying in a war of their government’s own making. Russian President Vladimir Putin continues to deny Russian involvement in the fighting, but the evidence is overwhelming and indisputable,” this study was published on October 15th 2015. Russia’s denails of military involvement in Ukraine have not been plausible at least since then. This report was released simultaneously with a report titled “Putin.War,” which was the brainchild of Russian opposition figure Boris Nemtsov, who was shot dead in Moscow shortly after he began collecting material for the report. 8. Open source research reveals that Russia shelled Ukraine in the summer of 2014. Bellingcat’s latest report, published on 21 December 2016, is dedicated to Russian artillery strikes against Ukrainian troops, which took place in the early stages of the conflict. The report shows a very large number of firing positions inside Russia, as well as documenting the target sites inside of Ukraine. “Thousands of artillery projectiles were fired by the Russian military on targets inside Ukraine in the summer of 2014,” the report reads. An analysis of maps of the conflict zone clearly shows that Ukraine’s army had significant momentum and was retaking many previously-occupied towns and cities in the period before these artillery attacks. The area where the attacks occurred is part of what is today a 400km stretch of open and unmonitored border between Russia and Ukraine. 9. The MH-17 catastrophe also proves that Russia has been acting in Donbas since early days of war. The Bellingcat investigative group claimed on 30 September 2016 that the responsibility for sending the Buk missile launcher used to down the MH-17 flight ultimately rests with the command of the Russian military, who had sanctioned the deployment of that missile system into Ukraine. Bellingcat first published an investigation relating to the shooting down of MH17 on 8th November 2014, and even in those early days it was abundantly clear that the missile launcher came from Russia. Those early findings have since been corroborated by the criminal investigation of the Dutch-led Joint Investigation Team, who have confirmed that the MH-17 airplane was downed by a BUK missile coming from Russia. “The system was transported from Russian territory into eastern Ukraine” and a short time later transported back to Russia, the report says unambiguously. 10. Russia allegedly uses force to kill “DNR”/”LNR” militants who have become an inconvenience. One of the most recent examples is Arseny Pavlov, a Russian citizen who was known as Motorola. The respected British newspaper The Guardian carried an article saying that Pavlov was “killed as result of either an internal feud or Russia removing ‘inconvenient’ separatist leaders in the field.” According to the article, the leadership of the “DNR/LNR” “coordinates its actions with handlers in Moscow, who finance and control the political landscape in the self-declared republics, despite claims to the contrary.” It would appear that those who refuse to follow the rules set by Moscow are being replaced by more obedient individuals. There were three other similar cases during the last six months: Alexander Bushuev, Alexander Nemogay, and Alexander Osipov were reportedly killed due to their disobedience or growing personal authority. Vitalii Rybak is an expert at Internews Ukraine and coordinator of UkraineWorld group, a networking initiative. The author thanks Paul Niland, Janet Gunn, Natalya Gumeniuk, Nastya Stanko, Oleksandr Nikonorov, Oleksiy Matsuka, Alya Shandra, Volodymyr Yermolenko, and other UkraineWorld group members for help and consultations. To join UkraineWorld group, please contact Vitalii Rybak: [email protected] or [email protected].